Self (in frustration): Why does everything always have to be so bloody complicated? Middle Gel (brightly): We’re women. We’re just made that way! I mentioned the other day that I had to replace the mailbox at Port Swiller Manor after the local loutish yoots gave it the Louisville Slugger treatment. Although it was a nuisance, I didn’t really give it all that much thought. CUSTOMERS ARE REQUIRED TO CONTACT THE LOCAL POST OFFICE BEFORE INSTALLING THE MAILBOX TO ENSURE ITS CORRECT PLACEMENT AND HEIGHT AT THE STREET. GENERALLY, MAILBOXES ARE INSTALLED AT A HEIGHT OF 41-45 INCHES FROM THE ROAD SURFACE TO THE INSIDE FLOOR OF THE MAILBOX AND ARE SET BACK 6-8 INCHES FROM THE FRONT FACE OF CURB OR ROAD EDGE TO THE MAILBOX DOOR. Of all the officious jackanapery. Of course, I didn’t put in any new installation. I switched the old, bashed box with a replacement of exactly the same size and shape. I mounted it on the same post and same cross-beam that have stood for years without exciting comment or criticism. I’ve done this three or four times before with nary a peep from anybody. Anyhoo, the mail is still being delivered and I’ve heard nothing more about it, so I don’t plan to actually do anything unless the post office starts giving me a hard time. If so, I plan to take the old box (which I haven’t chucked yet) and stick it back on the post just out of spite. I don’t recall that I’ve ever had reason to complain about WordPress since arriving here from the wilds of MooNooviana (and before that Blogsplat) many moons ago, but where the heck did my linkie categories suddenly vanish to? I rely on my familiarity with the layout to make my surfing as efficient as possible. Take that away and I’m just scrolling helplessly. Hopefully, by the time you read this post they’ll have come back from whatever corner of the ether where they’re lurking and you won’t have any idea what I’m talking about. UPDATE: Oh, good, it seems to have fixed itself. I find that many such problems simply go away if you ignore them long enough. A colleague is getting up a lottery pool today ahead of the big $500 mil power-ball drawing tonight. I don’t usually go in for this sort of thing, but that’s a pretty durn big pot and baby needs tuition payments. So I thought what the heck. However, when I went to pull what I thought was the remaining fiver out of the port-swiller wallet, I discovered that the mice gels had been into it already and it was quite empty. I know it won’t happen, but if the pool does come up with the winning ticket, I’m going to be seriously steamed. I can’t help wondering: Why did nobody ever cast Lee Van Cleef in the role of Little Phil Sheridan in the movies? And if it’s because there wasn’t a movie about Sheridan or at least with Sheridan in it, why wasn’t one written? Lost opportunity, Hollywood. Lost opportunity. This thought occurred to me because I’ve started in on Sheridan’s memoirs. 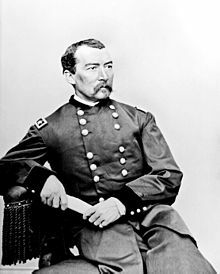 From what I’ve read so far (I’m up to news of Fort Sumter reaching the Oregon coast where Sheridan was stationed), I may have to revise some of my previous views about the man. The U.S. Naval Observatory’s Geoff Chester offers the reasoning behind the name: “[The] name comes from Native American skylore reminding trappers to set their final traps for the season before the beaver ponds freeze up for the winter,” Chester writes. Well, okay. I know that every full moon has all kinds of different names, so why not add this one to the collection. However, I am startled to realize that I seem to have missed both the harvest moon and the hunter’s moon, my two favorite in the bunch. Where in Heaven’s name did fall get to so fast? ♦ I warned y’all just yesterday what an ogre the onslaught of Christmas “musick” was going to make me. Well, it’s happening faster than I thought, perhaps because I managed to suppress so many horrid memories from last year. I defy anyone to listen to “I’m Dreaming of a White Christmas” performed on the pan flute and not be overwhelmed with the desire to grab a sledge hammer and head for the radio studio. Hulk smash! ♦ People who say that baseball is no longer the national pastime are actually saying quite a bit more than they realize. And it’s not complimentary. ♦ Back in September, I pre-ordered from the devil’s website a copy of John Zmirak’s new book, The Bad Catholic’s Guide to the Catechism. Evidently, there is some kind of production glitch, as the devil has been sending me periodic emails announcing shipping delays. The latest one seems to require my permission to go ahead with the order when the book becomes available. It reads, in part, “If you do not approve this delay by December 17, 2012, we will cancel the item. However, if the item becomes available before that date, we will automatically ship it to you. If the option to approve a delay is not available from this link, that means there has been a change in your order and approval is no longer necessary.” I know this makes perfect sense, but somehow the way it is written makes me a bit dizzy. ♦ Speaking of such things, sparked I suppose by current insanity events, I have felt an increasing urge of late to delve into the writings of Friedrich Hayek. I see him quoted all the time, but I’ve never sat down and actually read one of his books. Why on earth would ol’ Robbo voluntarily read an econ book? Just to keep morale up, y’know? ♦ And speaking of economy, I am of the opinion that leftover strip steak makes a far tastier lunch meat than rib-eye. I think it refrigerates better. Why this would be, I couldn’t say, but empirically I notice the difference. Well, that’s about it for the moment. UPDATE DUO: On the other hand, The Hobbit in Latin? Rem cupiiiiiiiimus!!! Bounce houses, castles, moonwalks and other inflatable bouncers are injuring U.S. children at “alarming” rates, according to a new study. Months after Pediatricians sounded the alarm on trampoline injuries, a study from the Nov. 26 issue of Pediatrics shows that the number of injuries from bouncy castles and similar party fare has climbed 15-fold since 1995, causing more than 5 injuries per every 100,000 American children. Oh. My. God. 5 out of 100K? That’s a .005% chance that little Geoffrey or Kaitlin is going to get a boo-boo! How can we call ourselves Americans if we let this wholesale (let’s call it what it is, my friends) child abuse last one single second longer? Oh, and children will not be allowed to actually bounce. They must instead stand sit very quietly and make no sudden movements. Cor lumme, stone the crows. I could insert the obligatory “when I was a kid….” line here, except I don’t want to accidentally inform the Mothe of some damned fool stunt from my misspent yoot about which she doesn’t know already. I could also note that when the gels were in their moonbounce mania phase, it seemed there was hardly ever a time when one of them didn’t get banged up. Somehow or other, they always managed to shake it off and plunge back into the fray. Go figure. ♦ My brother had the brilliant idea to unload all the kids at an indoor trampoline park on Friday. Not only did we get the shank of the afternoon to loll around in peace and quiet digesting the previous evening’s browsing and sluicing, the younglings were positively worn out by the time we picked them up and wonderfully subdued. Well done! ♦ Among the guests this year was my old father’s first cousin, a childless widow who I only met for the first time about a year and a half ago. She turns out to be witty, intelligent, well-traveled and absolutely chock-a-block with family history and genealogy. (No word yet on whether she also has a shoebox full of shares in Australian diamond mines.) I suspected we might become good friends when we got into a detailed comparison of our drives down. (She actually doesn’t live very far from us and took the same route.) I knew we were going to be good friends when I discovered that she listens to the same classickal radio station as I do and also noticed like me that the afternoon host has a habit of sometimes saying “Tchai-kow-sky” instead of “Tchai-kov-sky”. I mean, peas in a pod, what? ♦ I won’t bore you with all the family stuff (at least for now), but one notable nugget is the fact that my great-great-grandfather’s (the Civil War soldier) in-laws were mill owners who operated a station on the Underground Railroad in southern Ohio. I think that’s pretty cool. ♦ Speaking of classickal musick, what with the extra week of post-Thanksgiving November and the fact that the local station has already rolled out its Christmas playlist, ol’ Robbo is going to be reduced to a snarling, spitting wreck by about December 14 or so, after he’s heard “If Bach Had Written ‘Jingle Bells'” or Schubert’s “Ave, Maria” on glass harmonica for the umpteenth time. Consider yourselves warned. ♦ To those of you scratching your heads about my various musickal gripes and wondering why I don’t just turn the radio off, I can only say What? And spoil my fun? ♦ Charlottesville, Virginny is a heck of a lot easier to navigate when the big Thanksgiving weekend ball game is being played down in Blacksburg. ♦ Before we left home on Thursday, I discovered that the port swiller mailbox had been knocked off its post for about the dozenth time. I can usually console myself with the thought that it was just an accident – somebody swerving to avoid a deer, a wayward snowplow – but this time it looked as if blunt force had been deliberately applied to the side of the box, judging by the baseball bat-sized dent in it. Heigh, ho. Well, I jury-rigged it on Thursday and then put on a new one Saturday after we got home. (The process of repair lasted well on into dusk, probably not the brightest of ideas but I wanted to get it done.) Stupid kids – I suppose booby-trapping the thing would leave me liable for damages if I ever managed to nail one of the little bastards. ♦ And so here we are. A chance of a bit of snow tonight and tomorrow morning. Woot! I trust you all had a pleasant Thanksgiving? Good. Us, too. One wonders what’s next. “Big Ticket” Tuesday”? “Cash-n-Carry” Wednesday? And let us not forget, “Stop Wasting Time At Church Talking To Your ‘Imaginary Friend’ And Get Your Backside To The Mall” Sunday. Feh. What with the extra week of post-Thanksgiving November to deal with this year, I’ve an idea it’s going to be an excruciatingly loooooooong season.